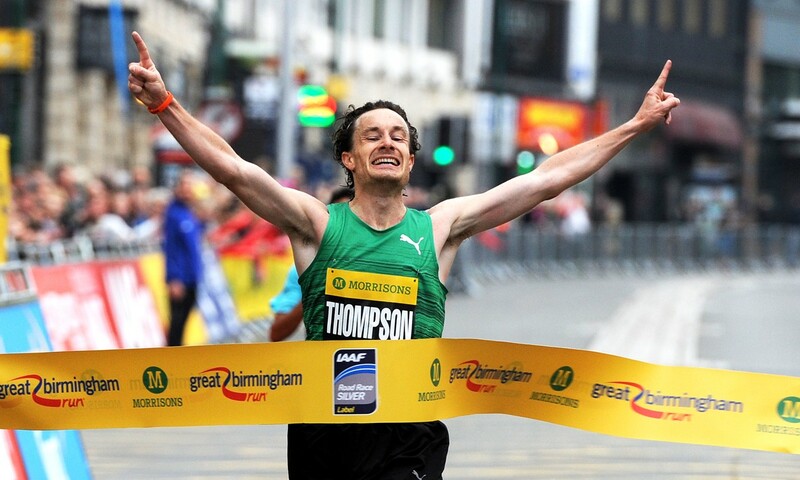 Chris Thompson showed he is returning back to his best form with an exciting half-marathon victory in 63:00. He finished two seconds clear of Spain’s Ayad Lamdassem. Norwegian Sondre Moen finished third in 63:09. Alastair Watson was the second Briton, in tenth place in 67:30. Poland’s Dominika Napieraj was the leading woman in 73:39. Spain’s Alessandra Aguilar was second. The leading British woman was former European Indoor 3000m champion Helen Clitheroe, who was sixth in 75:57. Paul Larkins’ report and Mark Shearman’s photographs will appear in this week’s issue. Bernard Kipyego defended his title with a time of 2:06:19. Joyce Chepkirui won the women’s race in 2:24:11. There were some good Dutch performances and Abdi Nageeye’s 2:10:24 earned him a spot in Rio de Janeiro, though Michel Butter and Khalid Choukoud just missed the Olympic qualifying time of 2:11, with frustrating times of 2:11:08 and 2:11:34 respectively. A fuller report and photographs will appear in this week’s magazine. Ishhimael Chemtah won the men’s race by a second in 2:09:00 from Gilvert Kirwa. Shure Demise won the women’s race in 2:23:37. Britain’s Paul Molyneux set a PB of 2:20:33 in 14th place. GB’s Jenny Spink (2:36:00) and Tracy Barlow (2:39:00) also set lifetime bests in 10th and 13th place respectively. Steph McCall ran a stunning final leg in an exciting women’s event, moving South London Harriers from ninth to first. Her 11:27 leg was easily the fastest for a leg advertised as 3km but clearly more than two miles. Belgrave Harriers finished second with London Heathside snatching third as four seconds covered the next three teams with Dulwich and Herne Hill Harriers just missing out. Belgrave were also second in the senior men’s race where Highgate Harriers were clear winners. Thames Valley Harriers’ Portuguese athlete Antonio Silva was fastest with a time of 13:27 for the approximate three-mile leg. Windsor Slough Eton and Hounslow were third with Herne Hill again close in fourth. Herne Hill were more successful in the younger athletes’ races and gained a one-two in the under-13 girls’ race. Martin Duff’s report and Gary Mitchell’s report will appear in this week’s issue. Leeds City won the men’s race as Lincoln Wellington were runners-up and the positions reversed in the women’s race. Leeds won by 24 seconds as the original second team, the University of Sheffield, was disqualified. Liverpool Harriers were third. The fastest leg was run by Trafford’s Richard Powell with 10:08. Lincoln were more dominant in the women’s race, winning by 43 seconds from Leeds. Rotherham were third just ahead of Durham. The fastest leg was run by Warrington’s World Youth 1500m fourth-placer Harriet Knowles-Jones, who ran 11:16. Local club Hallamshire Harriers were the pick of the younger athletes’ events, winning three titles. Roger Norton’s report and Steve Bateson’s photographs will appear in this week’s issue. City of Stoke dominated the men’s race, leading all the way after Alex Brecker blasted a big lead on the first leg with the day’s fastest time of 15:06. Tipton Harriers and Cannock and Staffs took the other medals. Charnwood easily won the women’s race, taking gold by more than two minutes from Wolverhampton & Bilston. Their victory was aided by their Potter twins, Juliet (17:39) and Jane (17:52), comfortably setting the fastest legs. Telford narrowly won the women’s masters race from Cheadle with Claire Martin the fastest on 18:22. Leicester Coritanians won the veterans men’s race, though Cheadle’s Mark Dalkins was the fastest with 16:00. A report and David Griffith’s photographs will appear in this week’s issue. Japanese sprint prospect Yoshihide Kiryu won the men’s 100m in 10.09. Darryl Hards won the men’s race in 2:30:46 while Kate Towerton won the women’s in 2:54:00. This new event saw a fast men’s victory for Ben Siwa in 47:04, nine seconds up on Philip Koech. Lenah Jeroptich won the women’s race in 55:58. Bideford’s Shaun Antell won in 70:08 while Bristol and West’s Annabel Granger won the women’s race in 81:18.